Belly Dance Topeka Facebook Group is a great place to meet other students of Belly Dance Topeka and to ask questions or find out about upcoming workshops in the area. Manuals and study guides are PDF files which are emailed to the purchaser for download. There is no refund on these items. Includes a list of all the moves covered in the Beginning Belly Dance course both for in class study and for study by DVD. There is space for you to write a description of each move in your own words to help reinforce learning. The manual also articles on various belly dance topics and information on outside resources to supplement your learning. The manual is emailed for FREE to enrolled students in the beginning belly dance course. Visit the Class Information page to enroll. 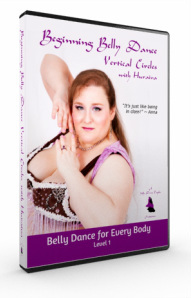 This manual is included in the Premium Package for Beginning Belly Dance: Vertical Circles DVD. Click here for more information. Includes a list of all the moves covered in the Intermediate Belly Dance in class study. There is space for you to write a description of each move in your own words to help reinforce learning. The manual also articles on various belly dance topics and information on outside resources o supplement your learning. The manual is emailed for FREE to enrolled students in the intermediate belly dance course. Visit the Class Information page to enroll. Get the most out of your DVD! The study guide includes helpful tips for creating the movements more easily, exercises you can do to help you gain confidence in your movements and make them more beautiful and strengthening exercises to for the muscles used in the various movements so that you can execute them with more ease and confidence. Get the DVD as soon as it is released AND the study guide and student manual to help you get the most out of your DVD. Get the DVD as soon as it is released! For more information on Beginning Belly Dance: Horizontal Circles, please visit the Belly Dance for Every Body Level 1 Horizontal Circles page. Get the DVD AND the study guide and student manual to help you get the most out of your DVD. Get the DVD! For more information on Beginning Belly Dance: Sagittal Circles, please visit the Belly Dance for Every Body Level 1 Sagittal Circles page. For more information on Beginning Belly Dance: Vertical Circles, please visit the Belly Dance for Every Body Level 1 Vertical Circles page. Get all three Level 1 DVDs, all three Study Guides and the Beginner Level Student Manual all for one easy price! Get both DVDs, both Study Guides and the Beginner Level Student Manual all for one easy price! Horizontal and Sagittal Circles Combo Pack! Horizontal and Vertical Circles Combo! Sagittal and Vertical Circles Combo! If you want to order more than one copy of a specific DVD or for international orders, please email for a shipping quote. Kansas Residents will be charged 8.80% sales tax. Bulk orders for resale (minimum of 10) please email for a discounted quote.